1 of the most magnificent sights of nature is the theme on offer in Northern Sky. This virtual visit to the Northern Lights is played using a 5 reel, 9 payline game engine and comes with avalanche reel re-spins and a free spins feature where you can look forward to 10 free spins with only higher value symbols spinning around the reels. Stakes range from between 10p and £100 per spin. Quickspin are one of the better developers when it comes to design and Northern Sky is another fine-looking game. The reels are set against a mountainous forest backdrop with the stars of the night sky shimmering away. The lower value symbols are gemstones. They’re joined by more lucrative Nordic animal symbols, all of which have been crafted out of crystal. They include owls, bears, wolves and reindeer. 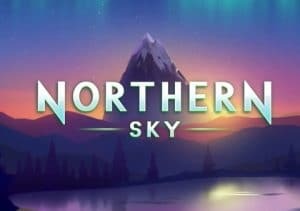 Northern Sky is played using an avalanche reels game engine – every time you land a winner, the successful symbols are removed and new ones drop in and replace them. A new payout calculation is made with the new symbols in position. The avalanche drop re-spins continue until there’s a spin where no new winning combination is created. Land 3 of the bonus scatter on the same spin and you’ll trigger the game’s Free Spins feature where you’ll be awarded 10 free spins. Not the biggest haul we grant you – your winning chances are boosted by the fact that all of the lower value gemstone symbols are removed from play. That’s pretty much it as far as extras go. Expect to see a steady stream of action courtesy of the avalanche reel re-spins. The free spins round offers some decent potential too. Throw the high-end design into the mix and Northern Sky is a very attractive overall package. It is a high variance title that can pay up to 3,111 times your stake on each spin! The majesty of the Northern Lights is difficult to replicate online. Quickspin has given it a pretty good go here though. Good looking and with a decent feature round, Northern Sky is certainly worth a closer look. If you like the Northern Lights, Glow by NetEnt is worth seeing.